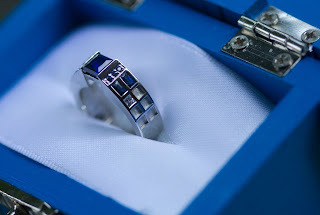 A user on Reddit calling himself megor posted pics of the ring he got his wife for her 30th anniversary. 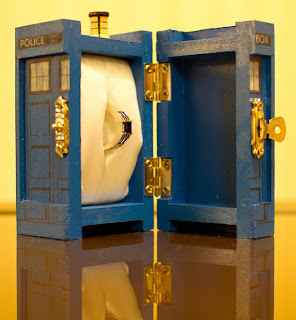 Turns out she's a big Doctor Who fan, so he got her a TARDIS ring inside a TARDIS box. The ring was commisioned by Art Gems Jewelers uses synthetic sapphire and cost $1600. The TARDIS box only cost $15. I can't afford it, but I want it! 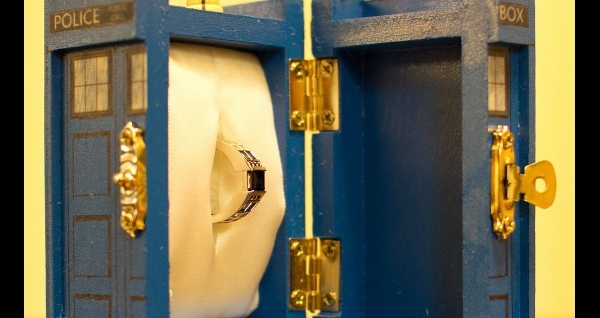 Wow, that box makes the ring look even better! Where can I find the box? I am in desparate need of something that awesome for my girlfriend's birthday. please help. The creator of the ring has a site called http://artgemsjewelers.com Jeremy. I'm not sure if he just sells the box though. Let us know how it goes!